Our good friend has introduced us to some beautiful Spanish flavours – chorizo, smoked Spanish paprika, jamón….I could go on but I might drool on the keyboard. Anyway given that breakfast is one of our favourite meals, the Dragon and I got inspired and decided to look into Spanish breakfast ideas. 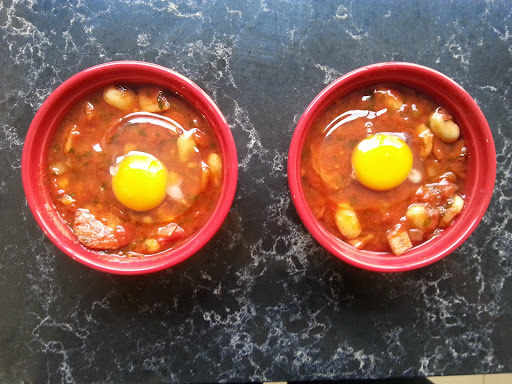 We stumbled onto Spanish baked eggs which isn’t that far from Mexican Huevos Rancheros, but has a different flavour profile. After researching a few recipes we came up with this meal idea. You could make it on a Sunday morning when you have a bit of time to do something special, or you could make it the night before and allow the flavours to infuse….because trust me the extra infusion time is worth it. The basis for this recipe made enough to serve four. So you can certainly bake it in a big dish with four eggs, but since there are two of us and we didn’t know how well the eggs would reheat we saved the rest. Since the next day was a Monday we decided to have the rest of the chorizo, bacon and tomato stew mix over brown rice for dinner and I can tell you…maybe it was because it was paired with a delicious red wine…but it tasted even better to us over rice. You could use this base a heap of different ways. One can of butter beans or any other beans that you enjoy. Make it your own. 2 x garlic cloves, either minced or chopped finely. I chose finely chopped for texture’s sake. 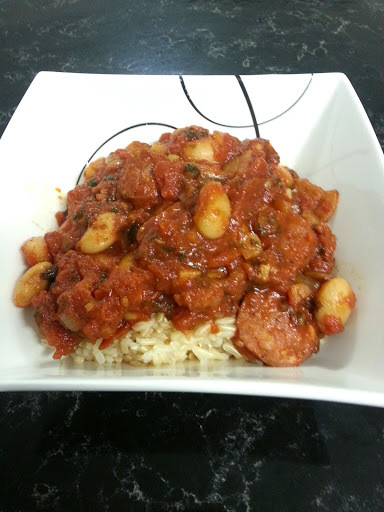 Use four bean mix, kidney beans, adzuki beans, cannellini beans, chickpeas or any other bean/legume you enjoy. Leave out the chorizo and just use the shortcut bacon or ham, or leave out the meat. Use coriander or parsley instead of oregano. Add jalepnos for a kick. Leave out the cayenne pepper if you want it mild. Add mushrooms, capsicums or any other vegetable that you love. Wilt fresh spinach into the mix instead of using the frozen spinach cube. Use brown or red onions or shallots instead of eschallots. Crumble some cheese (eg feta) over the top. Serve on a bed of spinach and rocket instead of rice for dinner. Cook mixture in hollowed out capsicums instead of casuelas for an edible bowl. 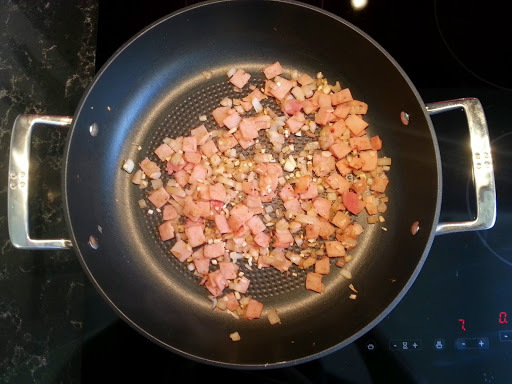 Cook eschallotts and bacon in a small dash of rice bran oil on medium heat until eschallotts are transparent and bacon is cooked. Add garlic, cook for one minute further. 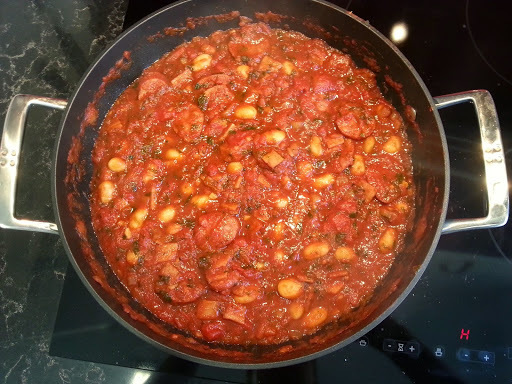 Add chorizo, canned tomatoes, spinach, butter beans, salt and pepper (if required, though the bacon and chorizo have quite the punch on their own). Distribute half the mix evenly in two ceramic dishes (called casuelas). Create a crater in the centre of each, and break an egg into each crater. If you are just making breakfast for 4, then use either 4 casuelas or one casserole dish and crack 4 eggs in. Serve with a sprinkling of oregano or other herb of your choice. We served them on wooden serving/chopping boards to reduce the likelihood of burning our hands while eating in case we forgot that the casuelas were hot. These boards are about $10 each from target so cheap as chips and you feel like you are at a fancy cafe. Ours have been used as chopping boards as well so please excuse the knife marks – call it well loved 😉 Also good for serving cheese and crackers on. Sprinkle parsley, oregano and/or cheese on top, depending on your fancy or leave as is because it is delicious. Wow. I love how the flavours enhance over time. It is a totally different meal at breakfast compared to dinner. I think I may be addicted to this. The most important thing is finding some element that is smokey. 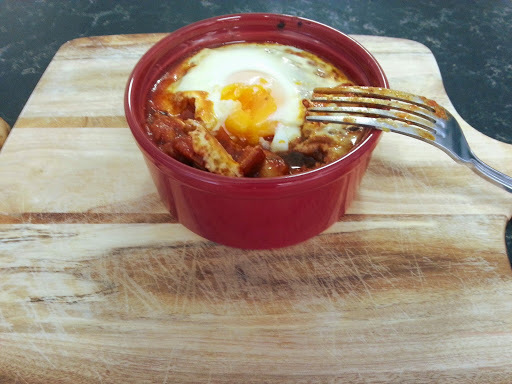 I used both smoked chorizo and a good quality smoked paprika which made a big difference. We loved this. It can be spun so many ways so it will make the rounds in different forms over time. I may post other spins on here at some point. 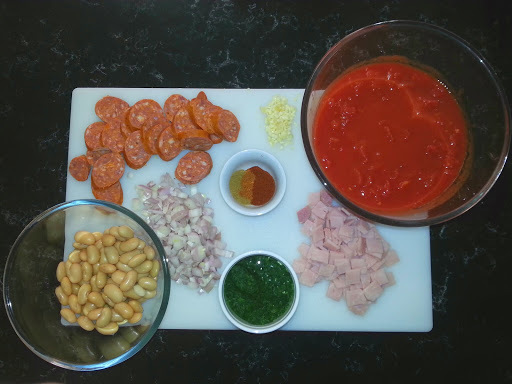 Chorizo is one of my favourite foods – how do you cook with it?